Yes you can paint UPVC Windows! Numerous homeowners upgrade to uPVC window frames due to the significant upkeep required by wooden frames, and most modern construction companies will use uPVC frames both for the ease of maintenance and the lower costs. But over time uPVC, though maintaining its weatherproof and insulative properties, can begin to look tired, worn and plain at the front of our homes. This has led many homeowners and business owners to ask the question we hear every day, can you paint uPVC windows? Well, the team here at The Restoration Group can. We are experts when it comes to painting uPVC windows! Unplasticized Polyvinyl Chloride, otherwise known as uPVC or PVCu is a form of plastic known for its rigid, low maintenance and water resistance properties. This makes it the perfect material for use for window frames, doors or conservatories. It also tends to be used for the manufacturing of drainage pipes. 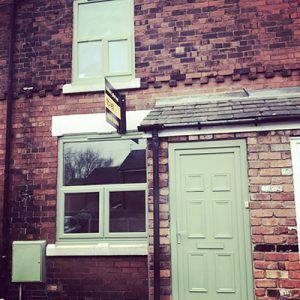 We have been painting uPVC windows at properties and commercial buildings all around the North West for many years, refreshing and renovating simply through the use of uPVC paint. PVC stands for Polyvinyl Chloride. PVC has in the past been used for the same applications as uPVC but it was identified that over time, due to excessive sun and weather exposure, PVC will age dramatically turning a yellow colour. This understandably does not make for an appealing look for your home windows and doors, hence why the resistant form of uPVC was adopted as a superior material. PVC due to its flexible characteristics has continued to be used in the manufacturing of cable insulators and toys. Why Choose to Paint UPVC Windows? As we have previously mentioned, uPVC is a hardwearing and resistant material, making it perfect for dealing with the often harsh and dramatically shifting British weather conditions, in particular, the ones we experience here in the North West where we are based out of. Other materials used for the manufacturing of window frames and doors, such as wood or metal, are a lot less energy efficient and can allow warm air to escape from your home and unless they are well maintained can become influenced by hot and cold temperatures as well as damp conditions. This is just one of the many reasons you should opt for uPVC and then choose us to paint your uPVC windows. If window spray painting is what you require and you are unsure which type of paints to buy, worry you will mess up and make a massive mess then look no further than us to perform a professional, clean job and to the highest standards. Otherwise, you will be dealing with the fact that you could get the paint on the windows, floor or the wall of your house. uPVC paint can be a nightmare to get off things that you do not wish to change the colour of. Here at The Restoration Group, we have an expertly trained team who use the latest uPVC spray painting technologies to restore, revitalise and transform your uPVC windows, doors and conservatory fittings. Rather than choosing to simply replace your uPVC, if you choose to have a restoration by spray painting your fittings you could save up to 80% of the cost of a full replacement. As well as this, our work comes with the added benefit of a 10-year guarantee and warranty that you would expect from completely new uPVC fittings. It is a no-brainer really. We can provide a vast range of uPVC paint colours to use when we are changing and refreshing the look of your uPVC windows. The most popular colours we use for painting uPVC windows are white, grey, oak, blue, green and black. However, despite these being the most commonly chosen colours that we can supply, we, in fact, have a selection of over 130 shades for you to pick from for your home renovation with us. If you have a particular colour in mind this can be discussed with our colour mixing team during your free home consultation. They are always on hand to discuss the best options for your property and to craft the perfect colour to suit your home when we are painting your uPVC windows. How do you Paint uPVC Windows? When it comes to painting uPVC windows at your home, our fully-insured, fully-qualified team follow a simple 5 step painting process to restore and revitalise your uPVC fittings with the uPVC paint colour of your choice. They first begin by conducting a deep clean of the area, remove any possessions or belongings that may obstruct the spraying process and also make sure the uPVC window surfaces are clear of any dirt, grease and grime which could prevent the specialist paint from adhering to the surface. We also use drop cloths to cover areas of your home to protect them from the paint. Next, our team will apply a slight abrasion to the uPVC to create the perfect surface for the paint to adhere to, before covering the glass with protective sheets, and masking any door handles and adjacent surfaces to ensure the paint does not leave any unwanted marks. We make sure that it is only the uPVC that receives a paint spraying. After the preparation is complete, spraying can be commenced using the uniquely formulated paint in the colour you chose. Our technicians will apply a minimum of three coats of paint depending on the requirements of the colour you selected. 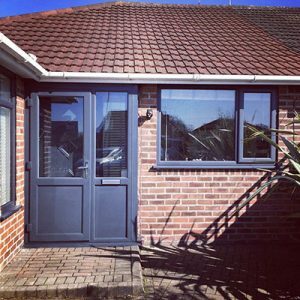 Finally, after around 30 minutes from the final spray painting coat, our technicians will inspect your uPVC windows to ensure the work carried out is of the highest quality and that you have been left with a perfect finish to your uPVC fittings. They will then begin to clean the area, unmasking and uncovering the glass, and returning your possessions to their previous spots. This entire process normally takes only one day to complete as uPVC paint can dry and cure in up to 24 hours. This means less disruption and strain on your day to day life but that you still receive the look of a brand-new uPVC in your home thanks to the painting of your uPVC Windows. As mentioned above, you can save up to 80% against the cost of a full replacement of your windows frames simply by having them repainted in a uPVC paint colour of your choice. Along with this, the Restoration Group team pride ourselves on being able to provide an affordable service so we provide varying payment plans and finance options to ensure that all potential customers can enjoy having their uPVC windows painted and for a reasonable price. So, we hope that helps answer your burning question of whether you can paint uPVC windows and if it does and you would like to receive a free quote for your window frames then simply complete the form on the right and one of our team will be in touch with your shortly to discuss how we can help. Alternatively, if you would like to discuss the question of “Can You Paint uPVC Windows?” in person with our expert team you can contact us by giving us a call on 0161 327 0482. For now, however, why not take a look at some of the successful work we have completed below.